How are you all cracking on after a glorious half term – are you having a week where you own it? I’ve found previously that half term is not the time to diet and certainly not stick to it if you are on one, as you find yourself reaching for the sweet treats to carry you on through. The weather has been absolutely amazing too, which makes sipping on water slightly harder than supping a beer. However as only I can, I started back on the shakes last Tuesday, after a wonderful weekend of dining out. Starting back on a VLCD during half term is probably not advisable, but it seemed to work for me because I was in the zone… the start of the month helps plus pressure to get summer body ready too. All was going well until a slight ‘meh’ moment on Day 4, but then Day 5 saw me cracking on it again to finish a week’s worth of the New You Plan with a 10lbs loss… that is enough to spur you on! I have nothing major planned for the rest of the month, but when something does pop up I will skirt around it as best I can and own it! My plan is to stay on the shakes and bars for the next couple of weeks and shift a little more poundage in this time. I’m doing ok and I am looking ok… so everyone keeps telling me, however, you know yourself how you feel. My friends have seen me at my worst and now they are seeing me at my current best but I would like to show off a better me. I am sure there will come a time when I am happy and the gym will simply be enough for me to keep in shape, but until then I shall keep motoring on! It was very quiet last week, how did everyone cope with Half Term? I think it takes our minds a bit longer to catch up to our changing weight than our bodies too. Thinking back to when I was my slimmest, for a long time I still thought of myself as obese. Hopefully your mind will catch up soon, as I think you look great! Half term was pretty good for me, I behaved (for the most part) and although I didn’t lose weight (due to time of the month) I’m feeling good! You’re looking good hun! Good for you for owning your week!! 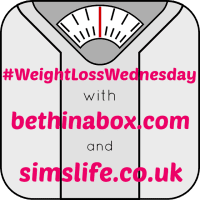 Wow, a 10lb loss is huge! Well done!! I know what you mean about how you feel in yourself. After I had Oliver everyone kept telling me how amazing I looked, but it just wasn’t good enough for me, and now I’m feeling the same way again. How you feel definitely effects how you look – the way you stand, walk etc and the outfits you choose.